A 10-year-old identified as Michael Thomas Jr. is cuffed by police as an outraged community looks on. Another day, another case of this country’s “finest” proving that they are anything but. 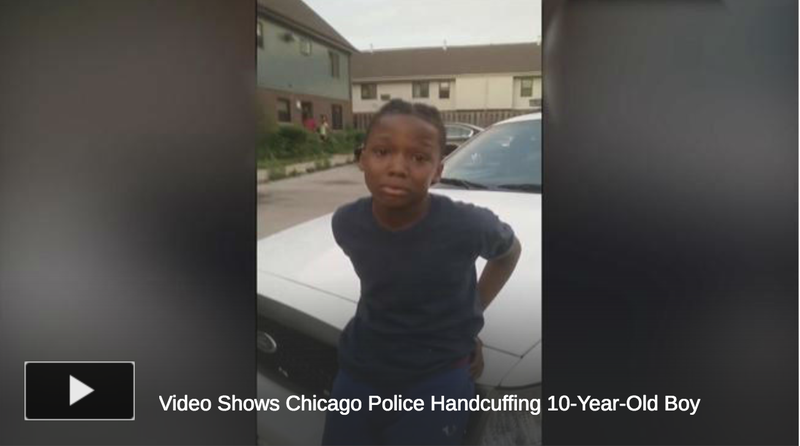 A 10-year-old Chicago boy was shackled placed in handcuffs outside his grandmother’s home on Friday after police mistakenly accused him of being a juvenile runaway with a gun. Chicago Police Supt. Eddie Johnson said Wednesday that police “followed all of the rules and protocols” when they detained 10-year-old Michael Thomas Jr., who matched the description of “a young man 10 to 12 years old that was passing out a gun,” according to the Chicago Sun-Times. “Keep in mind, this is difficult for an officer to tell right off the bat if you’re 10 years old, 12 years old [or] 14. … So they handcuffed the kid for safety reasons because he did match that description. They followed all the rules and protocols that we have in place. So I’m not concerned about that at all,” said Johnson, who was asked about the incident at an appearance with Chicago Mayor Rahm Emanuel. NBC affiliate WMAQ-TV spoke to several family members, including Michael’s grandmother, uncle and mother, and shared a longer video. The boy’s uncle confronted officers at the scene and could be heard on the cellphone video demanding to know why his nephew was in cuffs. The boy’s mother, identified as Starr Ramsey, demanded an explanation from police after the traumatic, 15-minute incident. “They need to apologize. He’s gonna be scarred for the rest of his life now,” she said. Johnson promises an internal investigation, but don’t hold your breath for an apology. And still, some wonder why black people run from police or cheer when a kid makes them eat his dust. Where Can Black Children Walk Out to Safety?